Welcome to the 1st SFU Academic Summer Camp for Aboriginal High School Students! 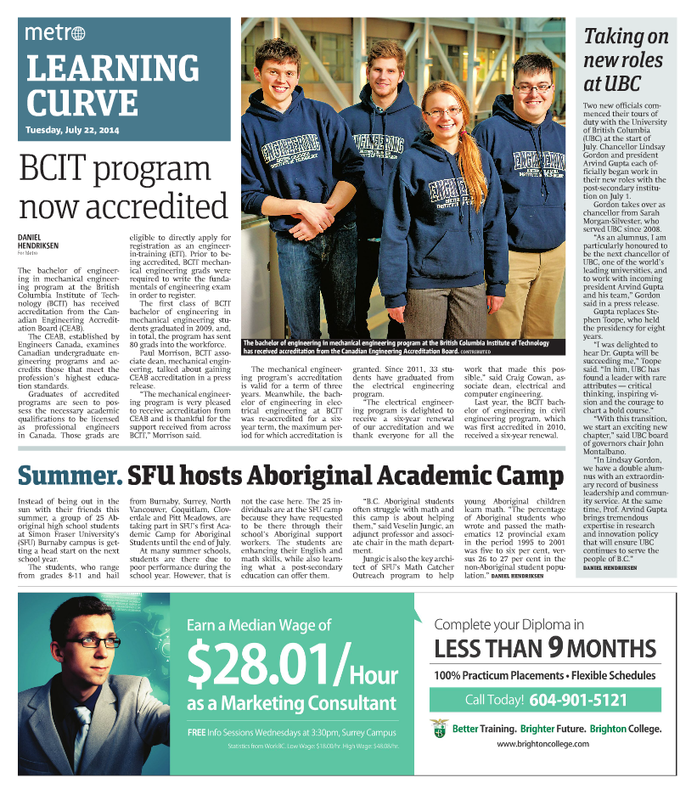 Between July 2 and August 1, 2014, the Department of Mathematics, the Office for Aboriginal Peoples and the Interdisciplinary Research in the Mathematics and Computational Sciences Centre (IRMACS), with the support of Natural Sciences and Engineering Research Council of Canada (NSERC), the SFU Faculty of Science and the Pacific Institute for the Mathematical Sciences (PIMS) offered the first SFU Academic Summer Camp for Aboriginal Students. The main goal of the camp was to help aboriginal students currently in grades 8-11 to accelerate in Mathematics and English. In addition, this camp offered the participants the opportunity to be exposed to the life of a university student. "This program has given me opportunities to better myself as a student its created so many different doors that lead to so many different paths that I find my self questioning what I've been told in the past because I have come to realize that I'm capable of doing anything with my life if I just believe in myself." "Math: I have never been a very good math student. I always just barely get through with low grades and because of that I had a low expectations and aspirations for my future with math." "The program taught me that I had the ability to do math the entire time I just didn't believe that I had that much potential." "My math skills have greatly improved I understand what I'm being told and my brain has been opened up to the possibilities of what I can do with math." "I want to continue to learn more and increase my knowledge of math. My expectations of myself are higher and I know that I'm capable of being brilliant student." "I want to thank my math teacher for showing me that I'm capable." "The program taught me that English isn't just about reading and writing, it's about speaking what you believe and showing how you feel." "My poetic ability has increased significantly and I enjoy writing much more now. In the past I had trouble explaining myself through writing. Now I feel like I'm capable of showing who I am through poetry and written work." "This summer has been great I have learned so many new things and made many new friends. It has been an awesome month! I wish would been going on longer." "I learned a lot from the first nation workshops, I wasn't really in touch with my first nations heritage but the workshops had made me want to be." "With all the information about the past of the first nation people from this camp and outside of it, it really must have been hard, and our generation is really privileged to be here." "Thanks for this photo, and for all that you did to make this happen. I'm moved and inspired by these young people's initiative to upgrade themselves educationally! They have accomplished a great deal and this will for sure equip them for success in life! I feel privileged to have been part of it, and I thank you for being so open to include my sons as for them too this was a great experience." "Thank you so much for allowing me to be apart of the program. I would like you to know that I enjoyed working with the first nations people. I was impressed at the rate at which they were able to comprehend the material that I taught them, as well as the work ethic that they exhibited."